In order to test a cosmological theory, astronomers have looked for a class of bright sources in the night sky where they also know the source galaxy’s redshift. This gives the cosmologist two parameters, the brightness of the source and the distance to the source. If it could be determined that all candidates in a sample of sources have the same intrinsic brightness (absolute magnitude) then these would be a standard with which to test their theories. The type Ia supernovae (a certain class of super bright exploding star) have been used for this purpose and it was with those measurements in 1998 two teams, independently, claimed to observe an acceleration in the expansion of the Universe.1 This resulted from testing the standard big bang cosmology with those type Ia supernova observations. The greater the distance to a source the dimmer it is. We know this from our own experience. But if we knew that all the sources were intrinsically the same brightness we could then use their apparent or observed brightness as a measure of distance. If we assume the Hubble Law to truly give a measure of distance to the source we can draw a line on a brightness (apparent magnitude) versus redshift (a proxy for distance) plot. This line is called the redshift-distance modulus and it is derived from the cosmology you use. See the solid black line drawn in Fig. 1. Figure 1: Apparent magnitude (i band) as a function of redshift for the 20,000 sampled galaxies (grey dots) of SDSS. The solid black curve is the magnitude-distance modulus taken from the Carmeli theory with the present epoch matter density Ωm = 0.04 and the Hubble–Carmeli constant h = 72.17 km/s/Mpc. The curve has been scaled by the addition of −24 magnitudes, which represents the reference-absolute-magnitude of the brightest galaxy in the group at any one redshift value. If we analyze the apparent magnitudes (brightness as seen at the observer on Earth) of the galaxies in a sample of 20,000 galaxies drawn from the Sloan Digital Sky Survey (SDSS), see fig. 1, we notice that the brightest galaxies (those with the lowest-magnitude value) form a clear line that closely follows the distance modulus versus redshift line. The latter was derived from the Carmeli cosmological theory.1,2 That cosmology I have subsequently used in developing a biblical creationist model. See A SOLUTION TO THE CREATIONIST STARLIGHT-TRAVEL-TIME PROBLEM. In fig.1 the solid black curve is the magnitude–distance modulus calculated using the present epoch observed matter density and the Hubble–Carmeli constant h = 72.17 km/s/Mpc (Hubble constant in the Carmeli theory for the expansion rate of the universe). The solid black curve has been scaled by the addition of −24 magnitudes, which represents the reference (fiducial) absolute magnitude of the brightest galaxy in the group for a given redshift value. This magnitude–distance modulus curve resulted from fitting or testing the Carmeli theory against the high-redshift-type-Ia-supernova-distance-modulus data from those two teams mentioned above. The result from using Carmeli’s model, instead of the standard Friedman-Lemaitre big bang model, was that it successfully describes the expanding universe without the need to include ‘dark’ matter or ‘dark’ energy. The way to understand fig. 1 is with an analogy using random groups of people. If we take each group of galaxies at a given redshift then we would expect that the brightest galaxy (with smallest apparent magnitude) in each group would have about the same intrinsic brightness or absolute magnitude. This assumes that all galaxies are essentially formed the same way. As with random groups of people, we would expect that the tallest person in each group would be about the same height. There is a slight departure at low redshifts, but this can be accounted for if we assume that the higher the redshift of the object the younger the galaxy, due to the finite travel time of the light. This means that the more distant galaxies are seen at a slightly earlier stage of their development and consequently may be brighter. In the high-z supernova studies, such an effect is corrected for. Therefore the data here is telling us that the Hubble Law works quite well for the galaxies. But what about the quasars? 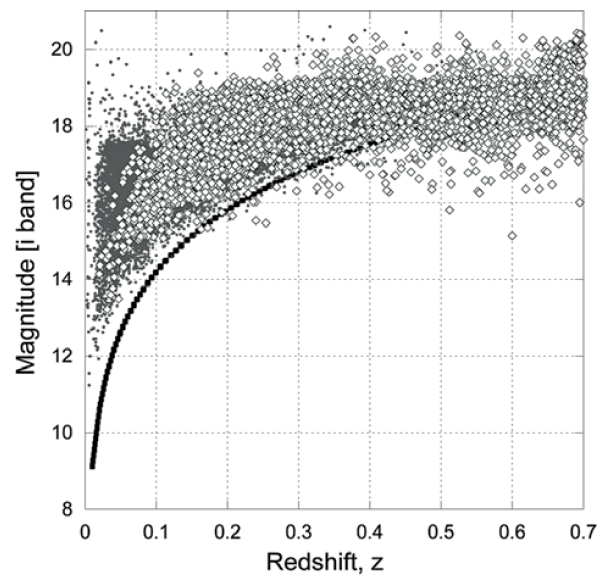 Figure 2: Apparent magnitude (i band) as a function of redshift for all the sampled galaxies (grey dots) of fig. 1 and the quasars (open diamonds) with redshifts z < 0.7. The solid black curve is the same magnitude-distance-modulus curve as in fig. 1. Fig. 2 plots the same galaxy sample as in fig. 1 but includes all the quasars (diamonds) in the sample that have redshifts z < 0.7. Notice that, in this case, even the low-redshift quasars, where z < 0.4, also seem to lie above the fit line for the brightest galaxies. But for z > 0.4 there seems to be no correspondence with the theory. Possibly, as suggested by others, there is a small contribution to the quasars’ total redshifts from Hubble Law cosmological expansion and a large intrinsic component of their redshift that is not due to expansion of the Universe at all but something not yet understood but related in some way to their youth. Then the higher-redshift quasars are younger—we are seeing them closer to their moment of creation. They have a larger intrinsic redshift component. The above analysis is telling us something very significant. As I have previously indicated it appears from the observational data (and I will write more on this soon) that we live in a galactocentric universe. We are located in a special place. And we are able to see the Universe God has created for us. The Universe we do see is isotropic (same in all directions) in the distribution of galaxies and quasars but it is definitely not homogeneous. The quasars should also follow a similar trend along the redshift-distance modulus line. They at least should all follow some systematic trend, even if there is a different offset magnitude. The standard model says they are just embryonic galaxies at great redshift distances but they do not distribute like galaxies do at redshifts z > 0.4. Halton Arp’s idea is that at low redshifts the quasars are becoming like normal galaxies. They evolve over time but they are not at their redshift distances, ie. we cannot rely in their redshifts to tell us how far away they are. But as they age their intrinsic redshift component decreases and we then tend to see them at low redshift with only their Hubble law (distance related) redshift. 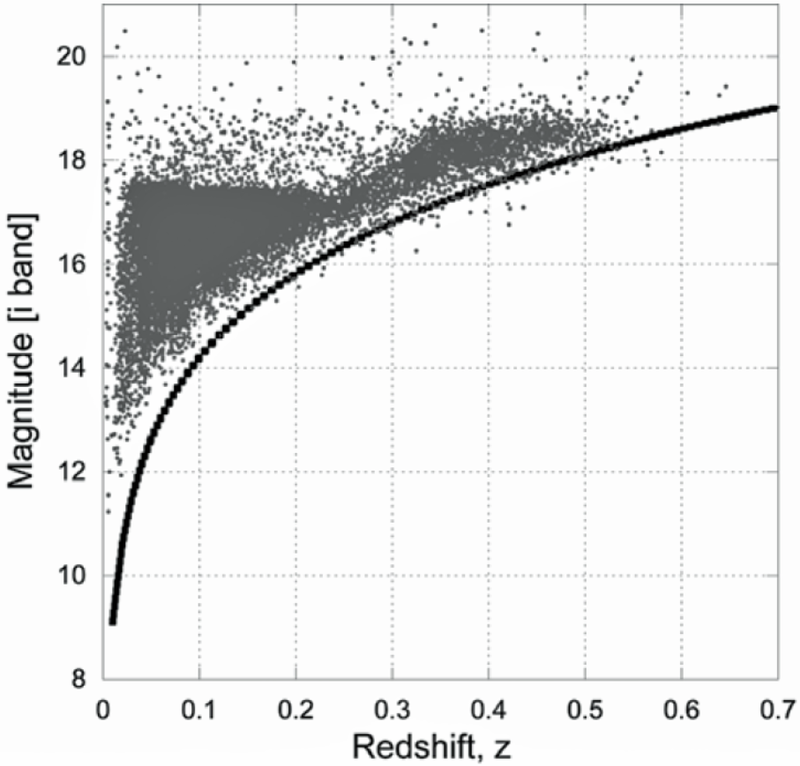 So this is what Fig, 2 indicates for redshifts z < 0.2. Spherical symmetry, that is isotropy, is the fundamental assumption in the Carmeli theory, but the Friedmann–Lemaitre theory requires that it be homogeneous as well. Homogeneity means no matter where you are in the Universe you would see the same distribution of galaxies, and quasars are just much more distant galaxies. But this evidence indicates that this is not the case. The supposedly most distant objects—quasars—are not distributed the same as galaxies, if you believe the standard line. Therefore the Friedmann-Lemaître theory cannot be applied under these circumstances, as shown in Fig. 2, but Carmeli’s theory is perfectly valid. The Cosmological Principle at the heart of the standard model essentially assumes that the galaxies, including the quasars, in the Universe are uniformly yet randomly distributed throughout the cosmos on some very large scale. Therefore all observers at all locations in the universe at the same epoch should see the same distribution of galaxies. There are no favoured places. The problem is the Universe is not uniform. An analysis of the brightness versus redshift of a small sample (compared to what is now currently available) of galaxies and quasars out to a significant redshift, indicates that quasars do not distribute themselves in the Universe like galaxies do. The exception being at lower redshifts. This fact, adds weight to the hypothesis promoted by the late Halton Arp that quasars are indeed galaxies but in a sort of embryonic form and that as they age their redshifts reduces due to a reduction of an intrinsic redshift component, not related to the Hubble Law distance. See HALTON ARP—BIG-BANG-DEFYING GIANT PASSES AWAY. This is quite a different interpretation to the standard paradigm, which sees quasars as extremely bright sources, black holes, in the early Universe. Their very high redshifts are due to their very great distance in an expanding universe. Could it be that the quasars are telling us that the standard paradigm, based on the Cosmological Principle, is wrong? Hubble Law: v = H0 r, where v is the velocity of the expansion of the universe, as determined by the redshift of the galaxies in it. Here redshift z = v/c for small redshifts, where c is the speed of light in vacuum. The distance to a galaxy is represented by r, and H0 is the Hubble constant, which has been very difficult to determine but nowadays lies somewhere between 55 and 80 km/s/Mpc. Feynman, R.P., Morinigo, F.B. and Wagner, W.G., Feynman lectures on gravitation, Penguin Books, London, p. 166, 1999. ← The heavens declare a different story!